Among the already-raunchy assortment of reality TV shows, the new “Rehab: Party at the Hard Rock Hotel” is pushing the envelope. And the Hard Rock Cafe International, Inc. chain (a different company than Las Vegas Hard Rock Hotel & Casino) doesn’t find the debauchery very entertaining. The Hard Rock Café recently filed a law suit for trademark infringement, trademark dilution, and a variety of other charges regarding the tarnishing of Hard Rock’s image. 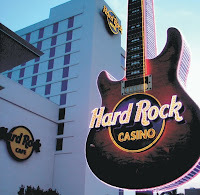 Hard Rock Hotel is a licensee of the Hard Rock brand. But Hard Rock Café now wants to revoke that license agreement. The case is No. 1:10cv07244-UA, filed in the United States District Court for the Southern District of New York. According to the suit, Hard Rock Café was founded as a celebration of Rock and Roll, good times, and fun. But sexual harassment, violence and crime are not part of its credo. Apparently, TruTV has no plans for canceling, or altering the show, which it hails as a main revenue source. If Hard Rock Café wins, Hard Rock Hotel may have to change its name.